At the time of publication, the United States is enduring its fifth week of a partial federal government shutdown. About 380,000 federal employees are furloughed, and an additional 420,000 employees have been working without pay. Food banks, GoFundMe sites and other extraordinary supportive efforts are cropping up to help federal employees and contractors who are struggling to cover their expenses. NHT is a voice for the residents and property owners of properties with federal project-based rental assistance (PBRA), which may be at serious risk as this needless shutdown drags on with no end in sight. Prior to the government shutdown, HUD told NHT and others in the housing industry that it had funds available to renew PBRA annual contracts for 12 months through the month of January 2019. 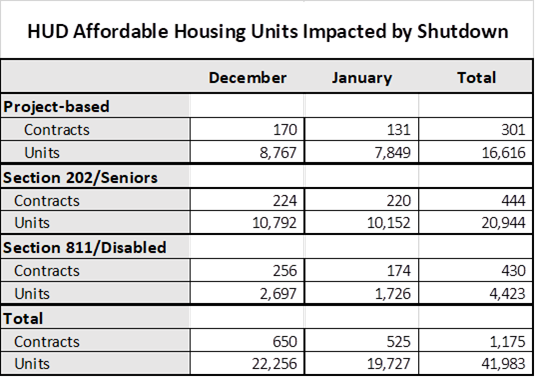 In early January, HUD clarified that in fact, the Department failed to renew 650 rental assistance contracts up for renewal in December and would not be able to renew an additional 500 contracts up for renewal in January. PBRA provides affordable housing for over 1.2 million low-income and very low-income households across the country at properties that are privately owned. Residents pay 30 percent of their income for rent and the federal government provides rental assistance to cover the rest. PBRA is critically important to the families and individuals who rely on it to access quality affordable housing. Fifty-six percent of these households include someone with a disability or who is elderly. The average household income is less than $12,000. Anything fewer than 12 months of full funding for PBRA contract renewals is likely to limit a property owner’s ability to provide supportive services to their tenants, impede or delay critical rehabilitation, or potentially could increase rent burdens on fixed-income populations. Shortfalls of funding for PBRA also may have a ripple effect. Privately owned properties with PBRA generate $460 million in property taxes for local municipalities annually and directly support 55,000 jobs. Further, nearly 10,000 of the 17,723 project-based Section 8 properties are insured by the Federal Housing Administration (FHA). The estimated unpaid balance of the FHA insured debt underlying properties assisted by project-based Section 8 contracts is over $13.5 billion. Without sufficient PBRA, many projects will be at risk and FHA ultimately could be left paying the tab. PBRA contracts also act as a critical support for project financing, allowing owners to leverage private debt and equity (often through the Low-Income Housing Tax Credit program) to permit project refinancing and rehabilitation. According to HUD, the PBRA portfolio leverages over $17 billion in private financing and equity. Failing to fully fund contracts, even in the short term, could erode investor and lender confidence, as they become increasingly uncertain that projects will be able to meet debt servicing and operating obligations, impairing investment and increasing financing costs. The following chart provides a breakdown of the types of subsidies impacted by the shutdown. The Section 202 number refers to properties with Section 202/PRAC. 202 Direct Loans with PBRA are reflected in the PBRA number. HUD officials have indicated that they are working to identify existing funding for PBRA properties with expiring contracts, reviewing each contract individually. For non-expiring contracts, HUD has indicated that it has sufficient funding to make payments for February. Beginning in March, HUD will not have sufficient funding if the shutdown continues. For Section 811 properties, HUD believes that they can use carry over funds to renew and fund the December 2018 and January 2019 expiring contracts. HUD has not identified a funding source for Section 202 PRAC contract renewals. Based on an assessment that 92 percent of these properties have at least $3,000/unit in replacement reserves, HUD has expressed confidence that most of these properties will be able to access property reserves in the short term. HUD’s data, however, is likely aged and may not reflect the actual balance. We are concerned that this approach could quickly deplete the reserves of these small and aging properties, noting that this is particularly concerning given that many of these properties are owned by small, under-resourced nonprofits. As the shutdown continues, other housing subsidies are similarly at risk. In rural communities, USDA will make rental assistance payments for Section 515 properties, based on January 20 certifications, the first week of February 2019. It is likely, however, that the Department will not have the money to make payments for the several hundred rental assistance contracts that will expire in February. Public Housing Authorities (PHAs) should have received Housing Choice Voucher (HCV) payments for January 2019 and we understand that HUD expects to be able to make February voucher payments. As with other programs, however, without additional funding HUD will be unable to make March payments. Finally, funds were available for Public Housing operating funds in January, and February funds are expected to be available. Funding is expected to be exhausted in February. For more information, the National Housing Law Project has released a helpful legal analysis of the shutdown’s impacts on tenants in federally-assisted housing programs. what other guidance and relief is HUD planning if there is continued and increasing widespread disruption of rental assistance. Due to the efforts of NHT and our partners, Members of Congress are aware of and concerned about the impact of the shutdown on housing assistance. Last week, Representative Mark Veasey (D-TX) and Senator Mark Warner (D-VA) sent a ‘Dear Colleague’ letter to President Trump that emphasizes the harmful impacts of the shutdown to the individuals, families, and seniors that rely on rental assistance along with the housing providers that choose to engage in these public-private partnerships. The letter had 137 co-signers in the House and 33 in the Senate. Senator Sherrod Brown (D-OH), ranking member of the Senate Committee on Banking, Housing, and Urban Affairs, sent a letter to HUD Secretary Ben Carson outlining the harmful impacts of the shutdown on HUD-assisted residents and providers, asking him for a description of what HUD is doing to reduce the harm to people assisted by HUD programs, and requesting that he urge President Trump to end the shutdown immediately. Last week, House Appropriations Committee Chairwoman Nita Lowey (D-NY) released new legislation to reopen and fund most federal agencies through September 30. While the previous bill the House had passed since the shutdown were the Senate bills, this new legislation reflects the bipartisan House-Senate conference agreements negotiated by Republican and Democratic appropriators last year. This package could pass the House, but Senate Majority Leader Mitch McConnell (R-KY) has said he will refuse to bring any package to the floor that does not have the President’s blessing. NHT will continue working with our partners to obtain the latest information from HUD and to keep Congress and the public informed about the impact of the shutdown on PBRA properties and residents. For more information, please contact NHT Federal Policy Director Ellen Lurie Hoffman.